Most of the day was taken up with cleaning, packing, moving, unpacking, etc. I did get in another swim this morning, however. This trip has been the first time I’ve swum laps since I broke my arm a few years ago. It has been good to confirm that my arm has fully recovered. I’m still in the paddler’s area for now but my goal is to work my way up by the end of my stay to the faster lanes, with the athletes. I can dream, can’t I? OK, the new place (where I will be for the month of May) is gorgeous — a real lived-in apartment rather than a place intended to be rented. My May apartment in morning light, from the master bed (there's also a futon in the rafters). And the neighborhood is touristy but not all that bad. I had a nice dinner at an authentic-seeming place in the next block, Le Verre Luisant. People actually spoke French! And the fact that I got into a pleasant conversation with the Swiss couple at the next table wasn’t bad either. So the second half of my stay is off to a good start. One more night in Montorgueil, then closing inventory with my landlord at 10 am. Then an urban hike with my cousin in the afternoon. Mot du Jour: “l’empire du Milieu” (Le Monde). China (“the middle kingdom”). 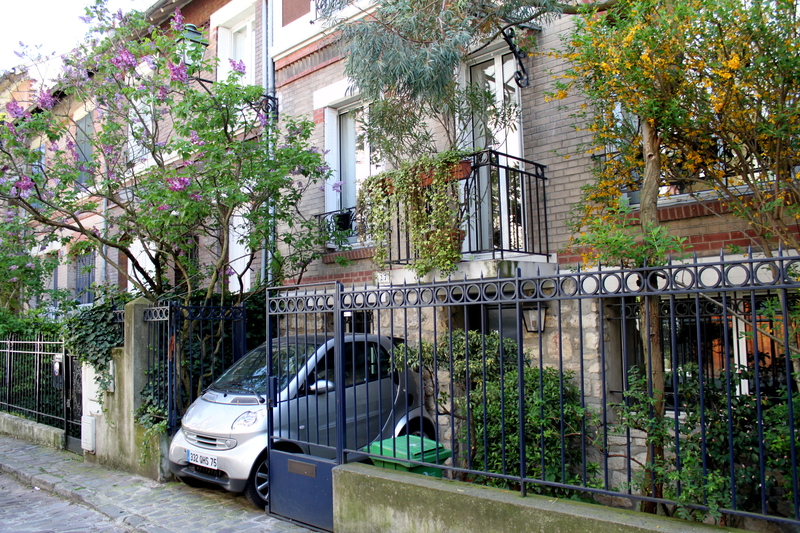 I’m feeling quite sentimental about leaving the Montorgueil neighborhood. 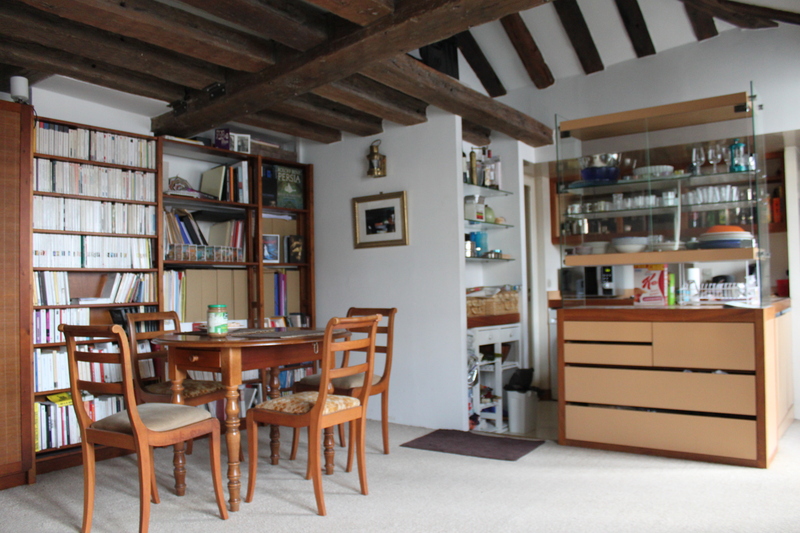 It has such good energy: historic, gustatory, domestic, and (mostly) French. I think I’m going to like the new apartment (despite missing the terrace), and its location is convenient. But the neighborhood is 100% touristy, and rather down-market as well. 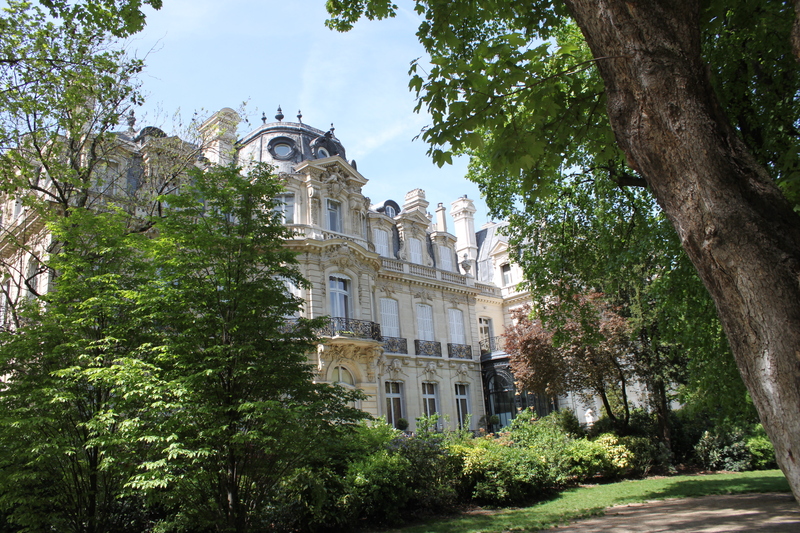 Montorgueil is just a short walk and I’m sure I will be back, but one’s experience is much affected by the immediate neighborhood, and that’s about to take a dive. So my last few days have been tinged with sadness at the ending of a good thing. The weather today was summery — warm and sunny except for a rain shower in the afternoon. I had both breakfast and lunch on my terrace, and in between got in a swim at the local pool. 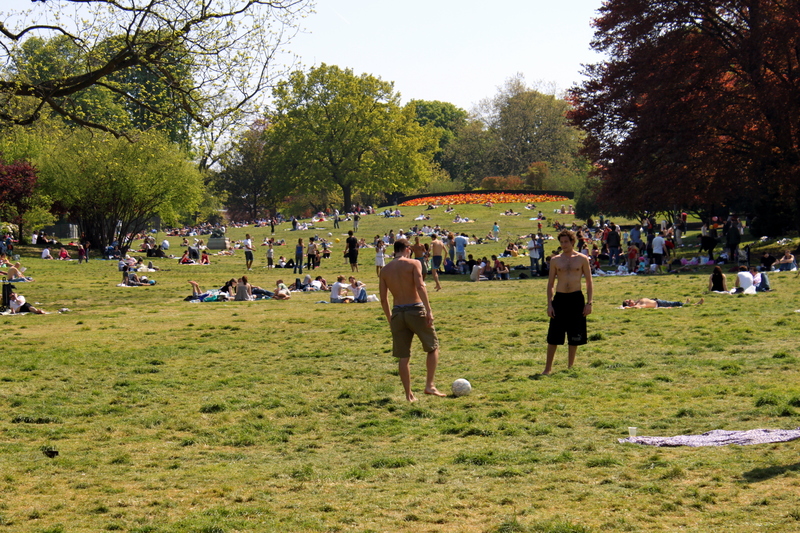 The good weather has worked a remarkable transformation on both noise and privacy. When it was cold, everyone kept their windows closed and nobody ate outside (except for the cafes on the corner with overhead heaters). So the street was relatively quiet, and my own closed windows muffled whatever sound there was. Now everyone has thrown open their windows and all the restaurants have put tables out on the sidewalk. So the noise level is much higher, and you hear it all — music, conversation, tableware, etc. I find it a happy murmur, however, and I still haven’t needed earplugs to sleep. When I opened my window this morning there was a woman across the narrow street, perhaps twenty feet away, doing the same. I couldn’t help but say “bonjour” even though it seemed like an invasion of privacy. But later, as I was putting some laundry out to dry, another woman said hello herself from the adjacent terrace, only a few feet away. We had a nice little conversation (in French), including the fact that she has lived in that apartment all her life. When we finished, she hailed a man watering his plants across the street and started talking with him. This is indeed like a village, but in some ways even more intimate, since a dozen people can look into my windows, and vice versa. After a nap I saw a puppet show at the Parc des Buttes-Chaumont in the 19e that I had missed seeing the last time I was here. 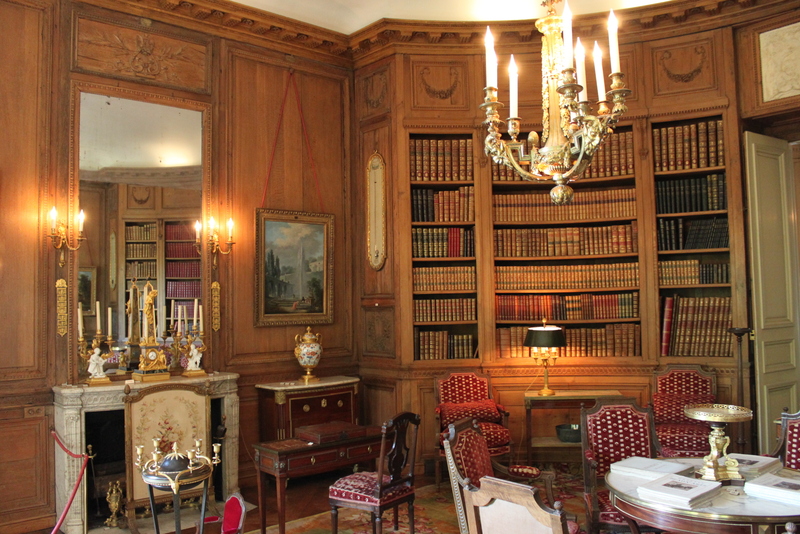 There are several “guignol” theaters around Paris, but this one, Theâtre Anatole Guignol, claims a particularly illustrious history, going back 173 years. The unique appeal of “guignol” is explained by a friend’s article in the Boston Globe. 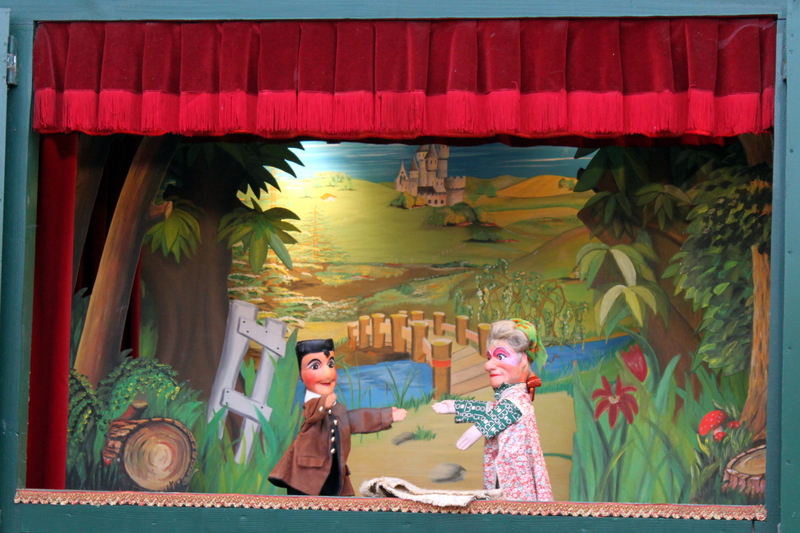 Guignol and his mother organizing a picnic in the country. Mot du Jour: “nids-de-poule” (le Parisien). Literally, “chicken nests,” but actually “potholes”. 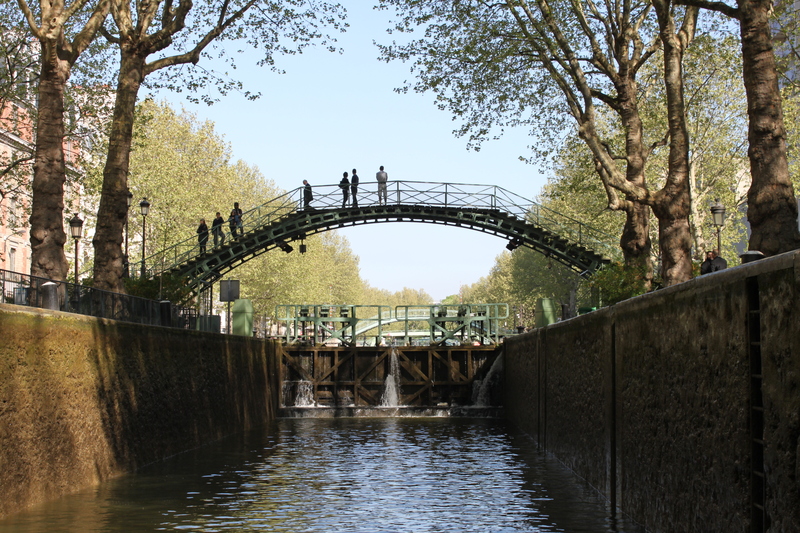 Many of the locks have little pedestrian bridges above them. The trip also goes through a long (2 mile?) tunnel that passes directly beneath the monument in the center of the Place de la Bastille. 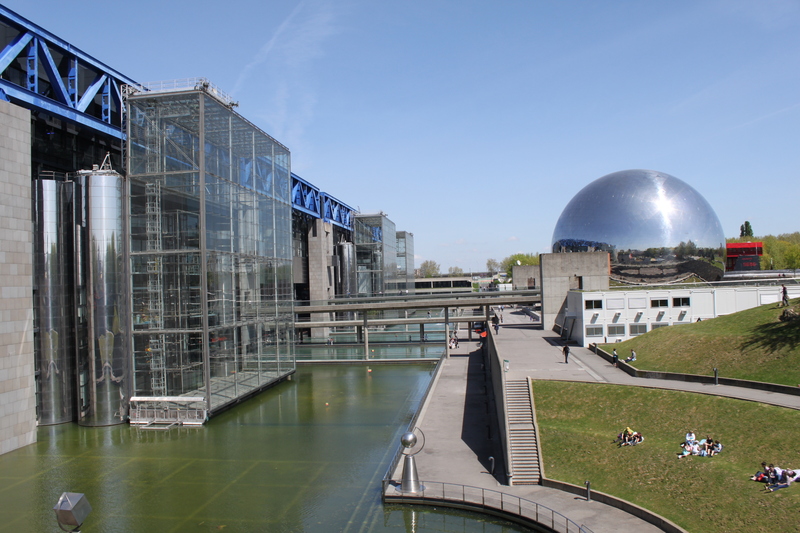 It ends at La Villette in the 19e, a massive complex that includes a park, exhibition halls, a music museum and a gigantic science museum called the Cité des Sciences et de l’Industrie. I spent a couple of hours at the science museum. It’s very well done although it was jammed because this week is school holidays. Cité des Sciences et de l'Industrie and the "Geode" (Imax theater). 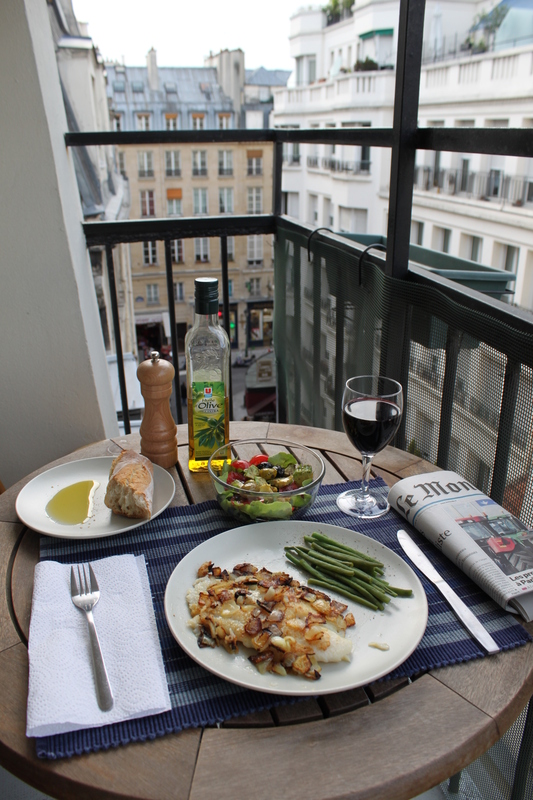 Dinner on the terrace of 13, rue Marie Stuart. I’m going to miss Montorgueil terribly when I have to leave, in just a few days. 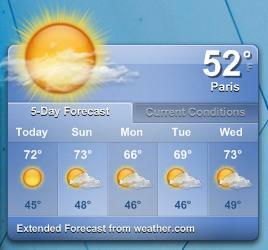 Not to mention how I’m going to miss Paris in just a few (well four) weeks! The highlight of the day was a brisk walk and a very authentic lunch with my Internet friend Hugo. Hugo at Le Relais de Venise - L'Entrecôte. After lunch I tackled a couple of errands, including the most challenging yet — getting renter’s insurance for my May apartment. 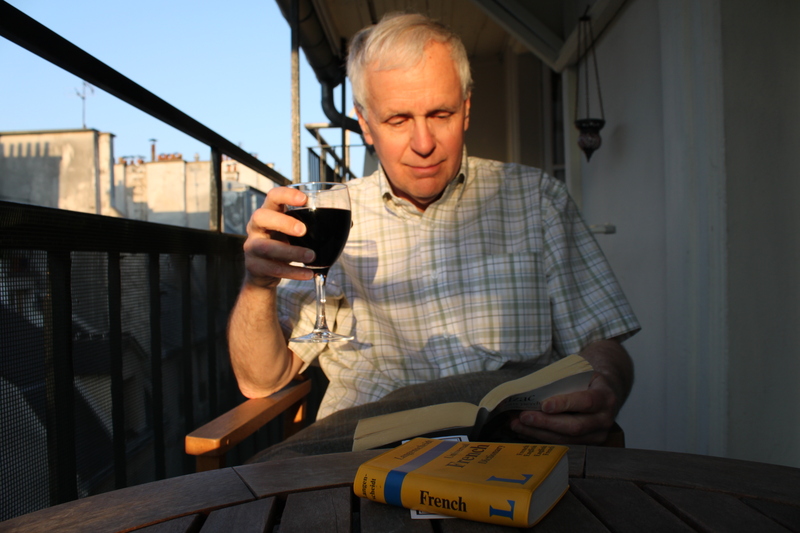 Mission accomplished, although it stretched my French, and the agent’s English, close to the breaking point. Then I saw a powerful Israeli film, Ajami. Fortunately it was in “v.o.” (original version) so I could follow the dialogue in French subtitles. If it had been dubbed into French I think I would have been lost. The evening was topped off with a good dinner at a Kurdish restaurant in the neighborhood (Dilan). Early to bed since I have to catch a 9:15 cruise boat tomorrow morning. Mot du jour: “à point” (restaurant order). Literally, “to the point” but actually a rough equivalent of “medium-rare”. Another lovely day, despite some dark clouds that hinted at the possibility that it may someday rain again here. 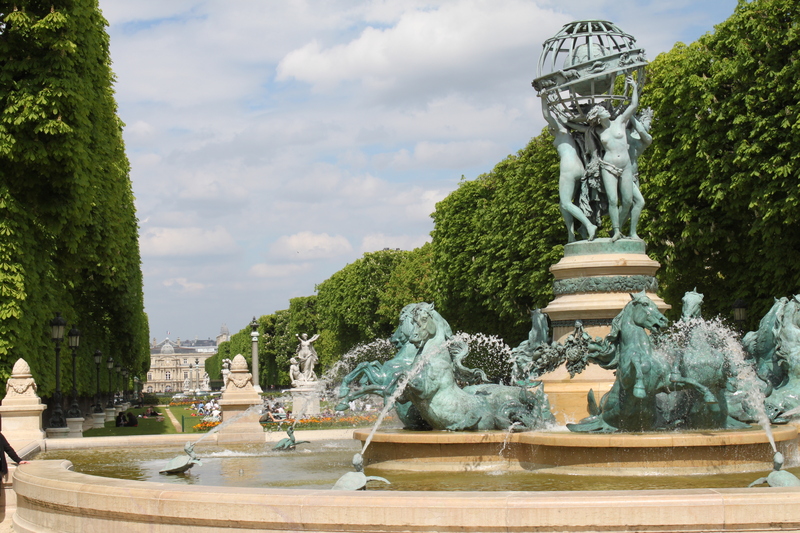 The Senate (with Sacre Coeur peeking over its shoulder) from the Fontaine des Quatre-Parties-du-Monde in the Luxembourg Gardens. I also enjoyed a quiet hour in and around Saint Sulpice. But other parts of today’s walk, around Montparnasse, were less inspiring. I don’t much like that neighborhood. It seems to be dominated by clueless tourists and establishments that cater to them. The Montparnasse cemetary isn’t bad, but Père-Lachaise is better. And that darned tower looms over everything! A visit to the Fondation Cartier pour l’art contemporain was a mixed bag. The current exhibition is by Beat Takeshi Kitano, a Japanese performance artist and art brut painter. I enjoyed the wittiness of his installations and paintings but I was turned off by the zaniness of his videos. It was fun to see little kids really getting into his stuff, which could mean either that its appeal is universal or that it’s puerile. Around 16:00 (4 pm to you) I suddenly felt tired, and it began looking like rain, so I came back home and took a nap. 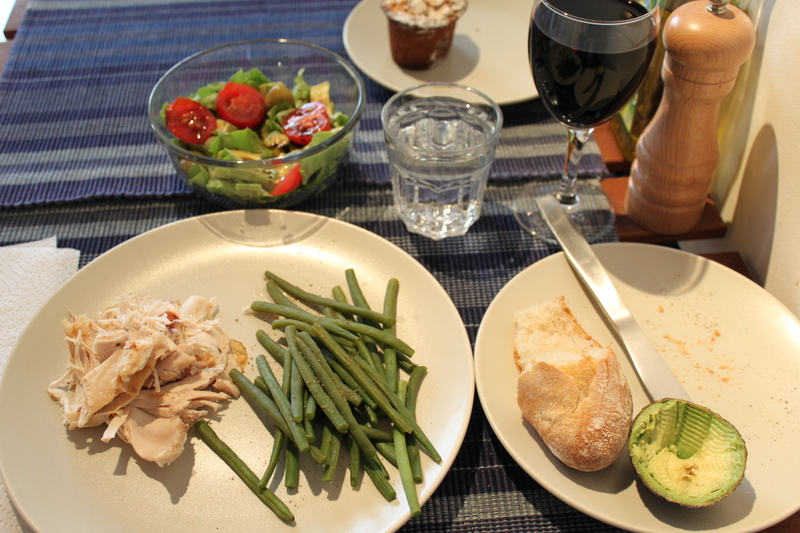 Rejuvenated, I cooked dinner with the last of the half chicken I bought last evening, accompanied by the ever-present haricots verts and a still-warm baguette from the local bakery. Dinner on April 25, 2010. The bread was still hot from the bakery, and dessert will be (half of) a "delice framboise". Jason was finally able to return to Boston today; the morning was mostly occupied with him getting packed. I’ll miss his companionship but it’s good that he’s able to get back to his regular life. One annoyance from the delay is that Jason’s car got towed, but he planned to take a taxi from the airport to the tow lot to minimize the damage. For the first time I went out to the store before breakfast, because we had forgotten to buy milk the night before. I was struck by how nice it was in the early morning (and I liked having a perfectly fresh baguette rather than the one from last night). I’ll have to re-think my daily habits to see whether I can build that into my routine. After Jason got away I focused on some practical issues relating to the change of apartments at the end of the month. One task was to pull 1,750 euros from my credit card to pay the rent and the deposit for my May rental. Since this exceeded my daily limit for ATM withdrawals I went into a bank. The receptionist said I could do this at a teller. After waiting about ten minutes the teller told me I had to go to a different branch. After waiting fifteen minutes at the second branch the clerk told me she had no money and I had to go to a third branch. At the third branch, after waiting another ten minutes, I was told that there was a 1,000 euro maximum, but I could get the rest on Monday. (And the withdrawal itself took another fifteen minutes!) I left with the impression that French banks are set up to hoard money, not to dole it out. I enjoyed an article in today’s le Parisien showing the relative popularity of world leaders in a six-country poll (U.S., Britain, Germany, Italy, Spain and France). Obama is out front at 77%, followed closely by the Dalai Lama at 75%. Hillary Clinton comes in next at 62%, followed by Angela Merkel at 54%. Sarkozy and Ban Ki-Moon muster just a feeble 37%. This afternoon I had a pleasant coffee with a friend of a friend who is planning to marry his partner in Boston this summer (Colt). 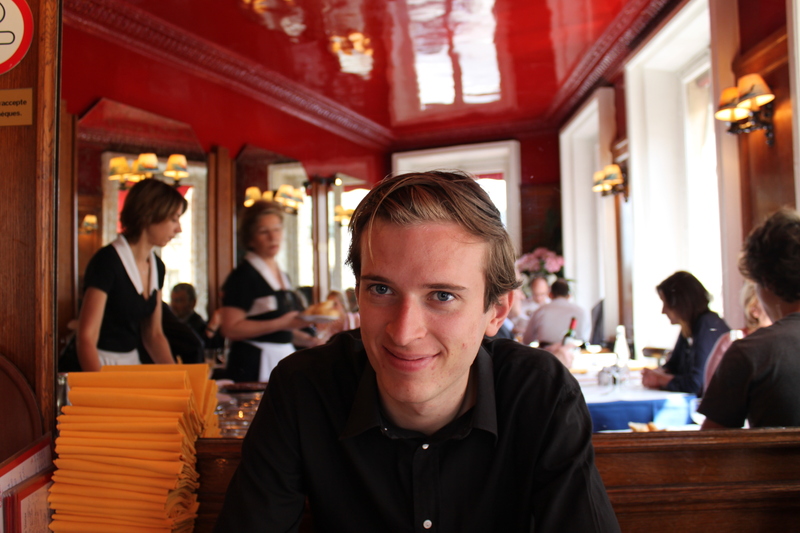 Then I had a cozy and affectionate drink and dinner with a Parisian whom I had met through the Internet (Jacques). The weather today was just about perfect. Cool in the morning but sunny and warming up to short sleeve temperatures by mid-day. I can’t believe the run of lovely weather we’ve had, and the forecast is for more of the same! Another lovely day, cool but sunny. Jason and I did a couple of walks in the vicinity of the Bastille. In the morning we walked the Viaduc des Arts and Promenade plantée, which I had done a couple weeks ago on my own. Repetition of things I like is part of the philosophy of living here rather than just being a tourist, and in fact I enjoyed the visit just as much the second time. 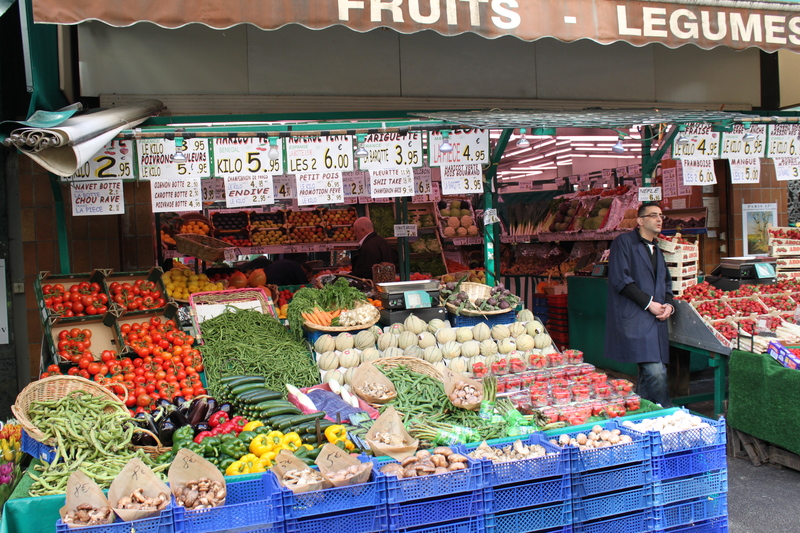 After lunch we explored the neighborhoods north and east of the Bastille. Much of it reminded us of Greenwich Village or Davis Square — young, grungy, self-consciously hip. 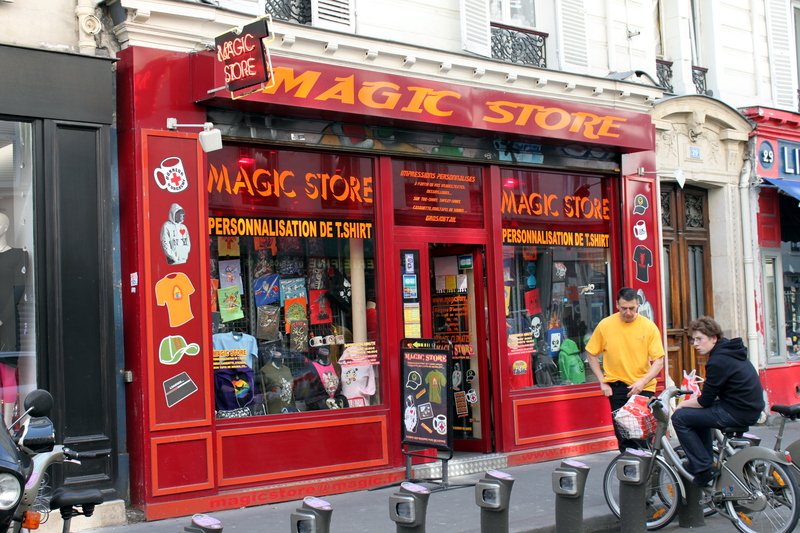 Shop on rue Keller, Bastille neighborhood. Yet there were also some magnificent apartment buildings in the area. 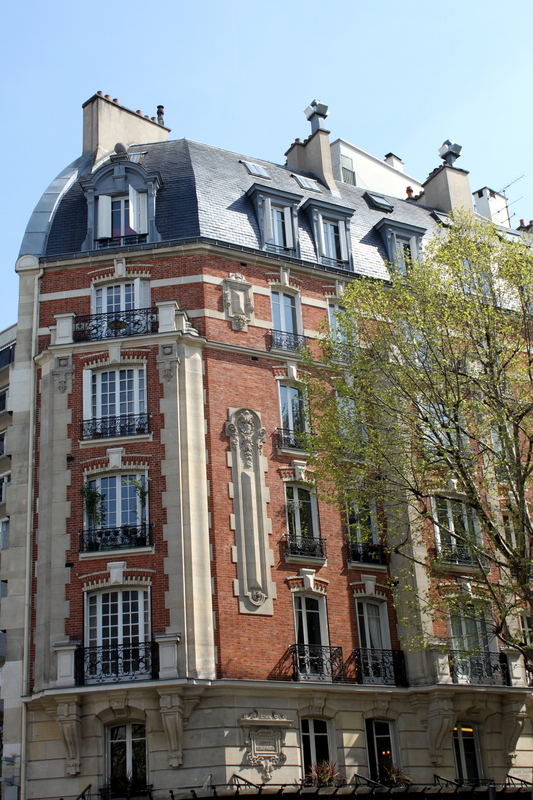 Apartment building on Ave. Ledru-Rollin, near the Bastille. Dinner was a home-cooked meal at the apartment of my cousin Lisa and her partner Ali, both of whom teach at the American University in Paris. I enjoyed catching up with Lisa and hearing news about the rest of the family; both Jason and I appreciated the opportunity to spend an evening in a Parisian home. 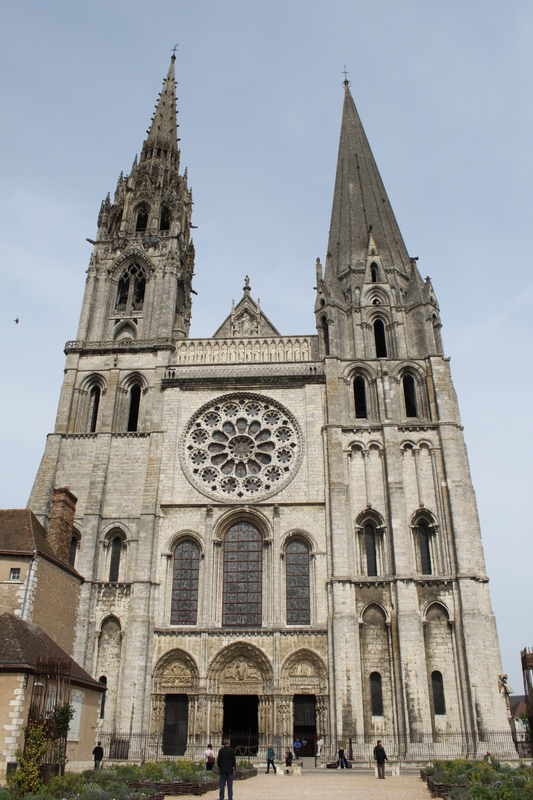 Jason and I spent the day in Chartres, which makes an easy and rewarding excursion. After resolving various ticketing problems on my last visit, with my nephew in 2008, you might think that we’d sail through that aspect. But no, I was still confused about where to buy the ticket and I forgot that you have to go up one level to take the train. Oh well. It’s a pleasant one-hour train ride (although pricey – nearly $40). As usual, I enjoyed the cathedral and the rest of the small city. The stained glass windows are the finest set of medieval windows in the world, and I am awed each time I revisit them. The cathedral itself has a calmness and dignity that even an atheist like myself finds inspiring. Chartres has a lot more to offer, however. Its streets twist charmingly and many of its buildings are ancient (including one apparently dating back to the Roman period). Steep streets called “tertres” go down the slopes adjacent to the cathedral and a cute little river runs along at the bottom of the hill. The shopping district is modern, bustling with happy residents oozing domestic charm. I’ve posted a set of photos, but I should caution that they’re more snapshots than my usual highly selected photographs: http://picasaweb.google.com/rwmack/Chartres2010# I was pleased with how well the stained glass windows came out, since they were hand held. 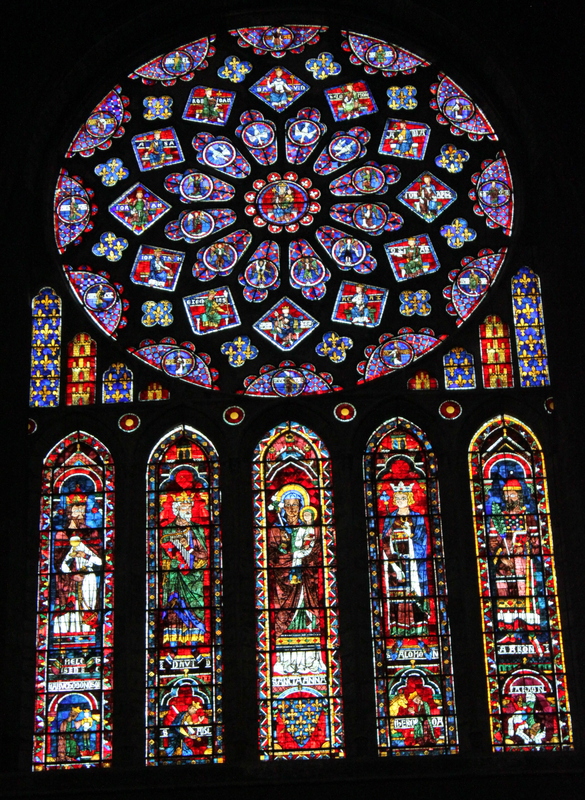 Stained glass window, Chartres cathedral. This evening I caught up for dinner with Larry Tu, an old friend who is on sabbatical here. At his suggestion we ate at a Laotian restaurant near Place d’Italie. The meal and company were both excellent. During the day Jason was thrilled to see con trails overhead, harbingers we hope of his return flight on Friday.